The T2/HTS-8 is the first 8" diameter model. Grover Pro Percussion has announced the T2/HTS-8 concert tambourine. This is the first new tambourine model rollout by Grover Pro in over 3 years. 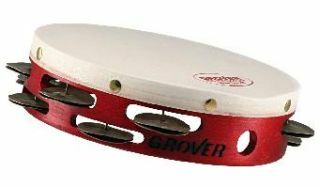 The T2/HTS-8 is the first 8" diameter model and is a welcome addition to Grover's line of Custom Dry Tambourines with heat-treated jingles. Professionals find this type of tambourine perfect for orchestral works that require precise articulation. This release coincides with Grover Pro's investment in a new heat treatment oven which was recently acquired from one of Boston's top flute makers. The new oven gives Grover Pro greater control over its proprietary heat treating processes, so critical to the manufacture of its Custom Dry tambourines. Visit the Grover Pro website for more product information.